Everything may seem normal except one site. Modern websites have a legitimate reason to push a lot of data to your browser that it retains for future sessions. This can vary from a browser “cookie” that maintains a session for a short period of time to other identifiers and even databases that are pulled up, but only when you visit the site again. This can snowball into “cruft,” a catchall term for digital code you don’t want. In particular, I see a problem with it in Safari, and have a way to troubleshoot and fix it. You’ll realize something is amiss is when you visit a website you use routinely and receive an odd error. You try closing windows, quitting the browser, even restarting your Mac, and the problem persists. My credit-union site, for instance, will throw up a server error that says my headers are too long and malformed. Thank you very much, but my headers are just fine! 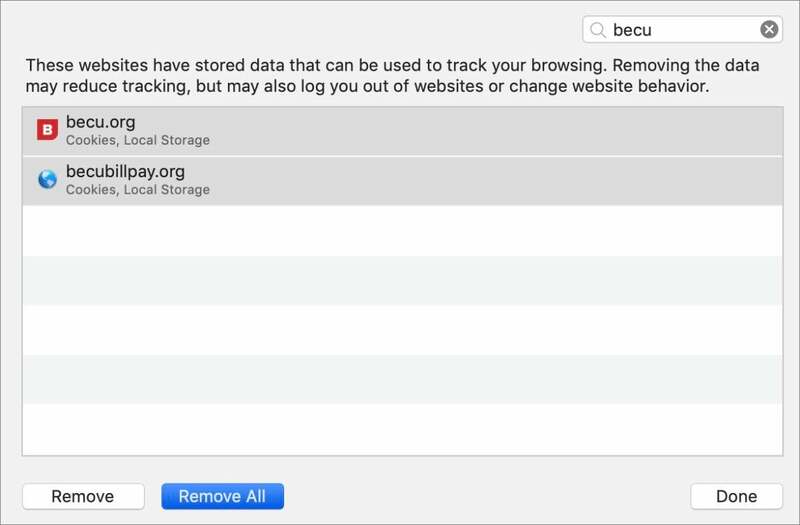 You can check whether stored website data is the problem by opening a private browser tab in Safari (File > New Private Window), visiting the site, and logging in. Private browsing windows don’t send any stored information, cookies or otherwise, and only retain site-specific details for as long as the tab in the private browsing window remains open. Launching another browser can let you cross check as well, like Chrome or Firefox. In the Search box at the upper right, enter part or all of the domain of site in question. It’s best to enter the least amount of information. So if the domain is bank.com, but they have secure.bank.com and loans.bank.com you enter just bank.com. Select the items that match, click Remove All, and confirm the removal. This only deletes locally stored information, not material from the remote site. Close the preferences dialog box and log in fresh. The Manage Website Data area lets me delete locally stored data associated with a site, like cookies and databases. If after step 6 the site still doesn’t work, but you were able to use a private browsing window or another browser, it’s time to contact the site for technical support help.